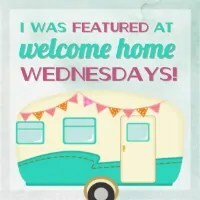 Welcome to Welcome Home Wednesdays #52!!! Anyway, if you missed it last week, pop over and enter to win a $100 Amazon Gift Card! Who couldn’t use that with the holidays right around the corner?? Like any good hosts we’re sitting right by the present table waiting until our guests leave so we can go through the loot… the loot being your Welcome Home Wednesdays #52 links! We can’t wait to check out what you’ve left for us. Trust me there will be a lot of pinning, tweeting and facebook sharing going on in the near future… we can’t wait to show off what you’ve left! Yeah…little by little we’re getting there too! Thanks for partying with us every week! Thanks for hosting a great party Erin. Very grateful for the feature of my mini bunting tutorial!! Thank you so much. Thanks so much for partying with us! I loved your little bunting, so cute! Thank you for hosting. Enjoy your week and take time to enjoy the sunshine! Thanks for your sunny smile visiting us each week, Marilyn! Hope your day is a lovely one!